After adding articles related to programming and HR management stuff. Lets have a quick review on fascinating craters impact around the world. What are Craters? Craters are bowl-shaped geological formation at the top of a volcano. Almost 170 terrestrial impact craters have been identified on our planet. These range in diameter from a few tens of meters up to about 300 km. Lets have a look on 10 most fascinating impacts. The Kaali Crater was created by a meteorite that reached the earth somewhere between the 4th and 8th century BC. At an altitude of about 5-10 km, the meteorite broke into pieces and fell to the Earth in fragments. Nearly a perfect circle, the Tenoumer Crater is 1.9 kilometers (1.2 miles) wide, and sports a rim 100 meters (330 feet) high. 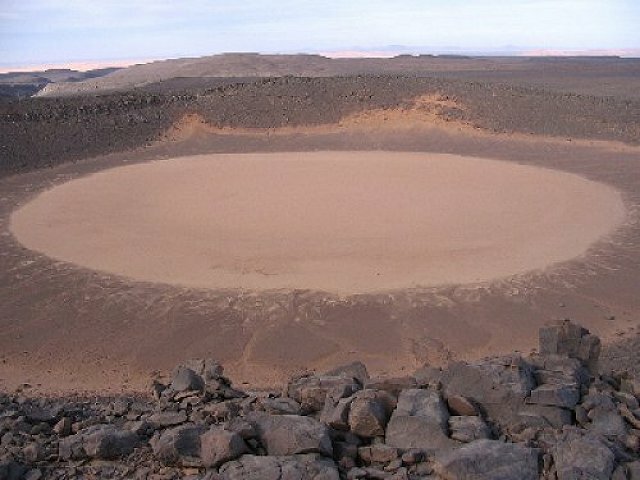 The crater is located in the western Sahara Desert, Mauritania. This impact occurred roughly between 10,000 and 30,000 years ago. The Lonar Lake in Maharashtra, was formed about 50,000 years ago when a meteorite hit the surface. The saltwater lake that evolved in the resulting basaltic rock formation has a mean diameter of 1.2 kilometers (3,900 feet) and is about 137 meters (449 feet) below the crater rim. The Monturaqui Crater is located south of the Salar de Atacama in Chile. The present dimensions of the crater are approximately 460 meter (1,509 feet) in diameter by 34 meter (100 feet) deep. The impact probably occurred about a million years ago. 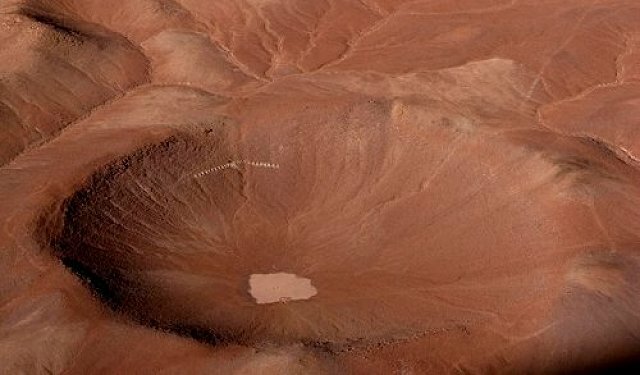 By its size and morphology, the Monturaqui crater presents many similarities with the Bonneville crater on Mars explored by the Spirit rover in 2004. Both craters are shallow, the size of the blocks ejected near the crater rim are similar, and both were formed in a volcanic environment. Located in the Namib Desert, Namibia, the Roter Kamm crater is about 2.5 km (1.6 miles) in diameter and is 130 meters (400 feet) deep. It was created by a meteor with a size of a large vehicle about 3.7 million years ago. The crater is clearly visible, but its floor is covered by sand deposits at least 100 meters (300 feet) thick. Combined with the orangey-red color of the Namib Desert the crater gives the impression of a Martian surface rather than that of our own planet. 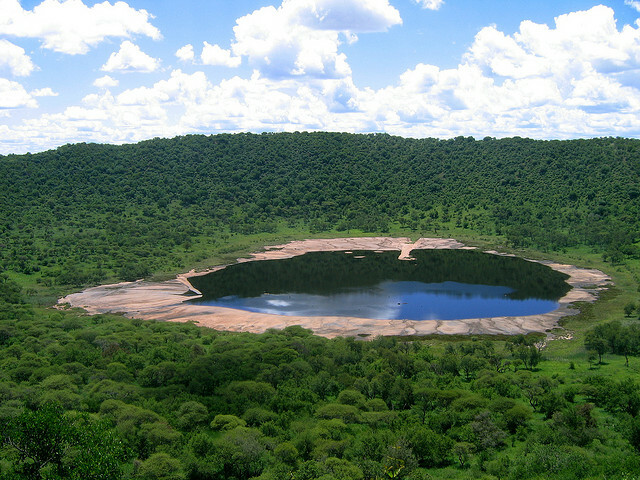 The Tswaing Crater was created by a chondrite or stony meteorite, some 30 to 50 meter in diameter, that hit the earth about 220,000 years ago. 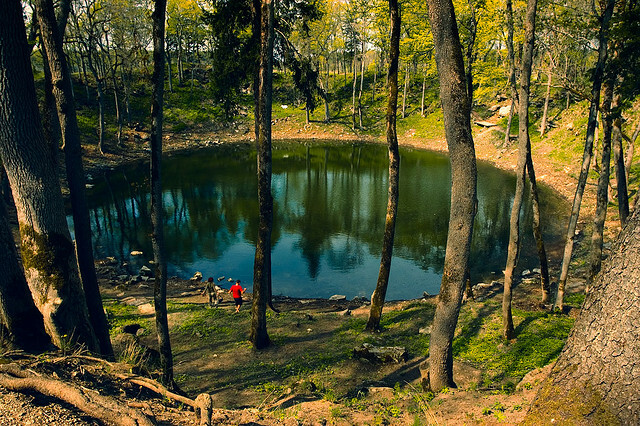 In the center of the crater is a small lake which is filled by a spring and rainwater. Stone tools from the stone age show that the crater was regularly visited by people in order to hunt and collect salt. European settlers named the region Zoutpan (Salt Pan) while the local Tswana tribes call the region Tswaing which means “Place of Salt”. A relatively young crater, the Amguid Crater is the result of a meteor impact about 100,000 years ago. It is located in a remote area in southwestern Algeria. 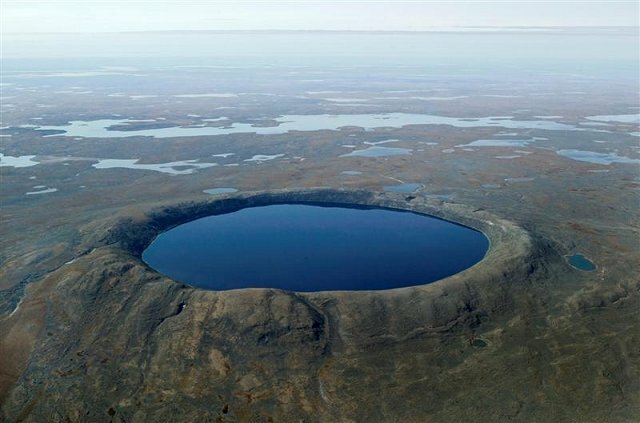 The perfectly circular meteorite impact crater is 450 meter (1476 feet) in diameter and 30 meter (100 feet) deep. The top of the rim is covered by blocks of sandstones that are several meters in diameter. The center of the crater is flat, and is filled by compacted eolian silts. 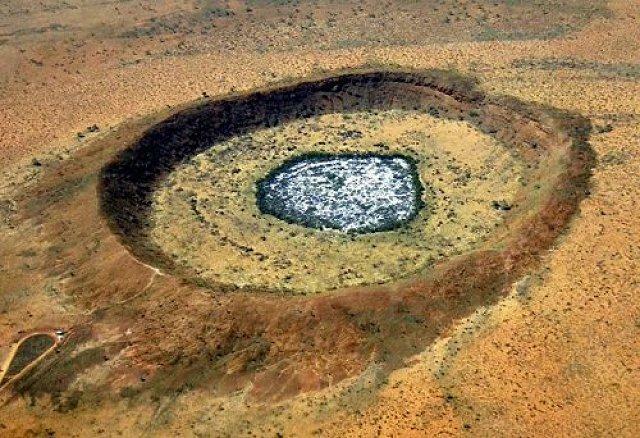 The Wolfe Creek Crater in Australia was formed by a meteorite that crashed into the earth 300,000 years ago. The 50,000 had a mass of about 50,000 tons and left a crater of about 875 meters (2870 feet) in diameter. The crater that was left was probably about 120 meters deep. Over the next 300,000 years the wind gradually filled it with sand and today the crater floor is 60 meters (200 feet) below the rim, which rises 25 meters above the surrounding flat desert land. The crater was discovered during an aerial survey in 1947 although the Aboriginal people have known the crater for thousands of years. Barringer Crater is the best known and best preserved impact crater on Earth. The crater is named after Daniel Barringer who was first to suggest that it was produced by a meteorite impact. The crater is still privately owned by his family and is also simply known as Meteor Crater or Arizona Crater. 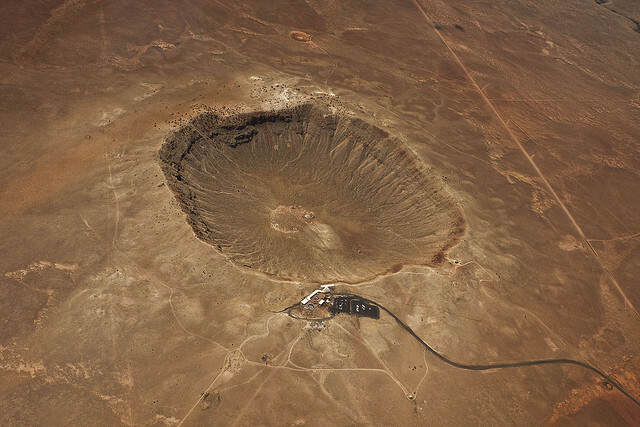 Measuring about 1,200 meters (4,000 feet) in diameter and 170 meters (570 feet) deep, with a rim 45 meter higher on average than the surrounding plain, the crater lies near Flagstaff, Arizona. 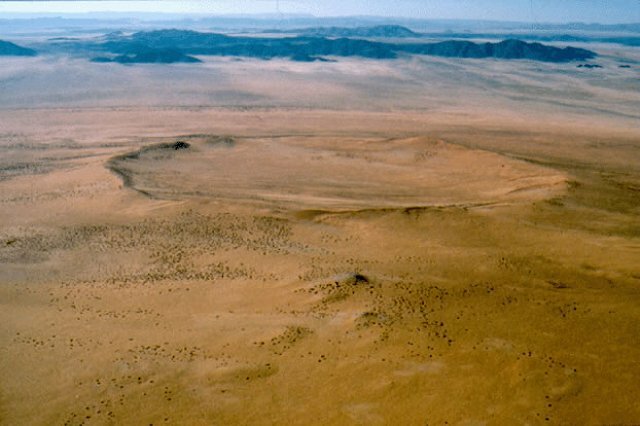 The Barringer Crater was formed about 40,000 years ago by the impact of an iron meteorite, some 50 meters(54 yards) across and weighing several hundred thousand tons. Recent research suggests that the meteor struck at a speed of 12.8 kilometers per second (28,600 mph).